Neither your age nor your gender will stop you from having a great time at EnterTrainment Junction. From small girls, ‘tweens, teens, moms and grandmas and, from little lads to dads, uncles and grandpas too. Trains? Yes, trains—ninety of them in all! The building houses the world’s largest train display: 25,000 square feet (1/2 of a football field!) done in eye-popping intricacy to detail. A funhouse or fantasyland is also at EnterTrainment Junction, not just trains. 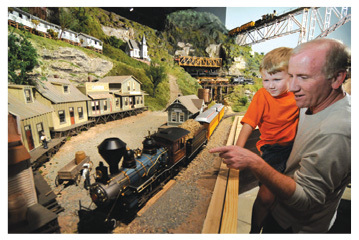 “What we are focused on is a family entertainment center and museum, where everybody of all ages will find things to excite and interest them,” said Don Oeters, president and creative inspiration behind EnterTrainment Junction. That is what Key magazine found, with features that will tickle even socially-absorbed teenagers mesmerized by smart-phones and tweets and selfies. It’s like Coney Island when you were a kid—non-stop fun stuff to do! This place is seriously incredible. There is a Clown College, a Tilt Room, where balls roll uphill and people feel the disorientation of a world on a slant; the Curtain Cove, where slatted curtains divide chambers and you become lost in the maze and left to find the way out. Take a trip through the universe, where a spiral tunnel with lights will have you holding on to railings for fear of falling into deep space, and the claustrophobia “squeeze” that is a badge of honor to go through, and great fun too. This time of year, there’s also a trip to see Santa. The trip takes you through Mrs. Claus’ kitchen, and a fresh-baked cookie for each child, and send them on to the elves toyshop, past the reindeer and into Santa. Also, the largest holiday season train display is available to the public free of charge. It’s spectacular! Hungry? The café at EnterTrainment Junction has subs, pizzas, hot dogs, snacks, drinks and more. There’s also a gift shop and toy store, where the toys and gifts are in a class by themselves, not to be found at the giant big-box retailers. More about the trains: the layout has attracted kids and adults who love trains from allover, including all 50 states and 37 countries. Kids (and adults) can also take part in six different scavenger hunts. Almost every detail of the layout is hand-made, with more than 100,000 hours in construction and journey from the 1860s to the 1950s. Through the layout, you’ll see a Union army encampment of the American Civil War with historical detail, including a trestle bridge burned by rebels, and rebuilt by Union troops in nine days. All this while trains of the era chug along, supported by sound effects that take you back in time.